Filipina Fort (named after the daughter of the Governor General of the Dutch East India Company, Jacob Mosel). It is located in the north-west corner of Melaka state on a headland on the south bank of estuary of the River Linggi and with a view of the Straits of Melaka. 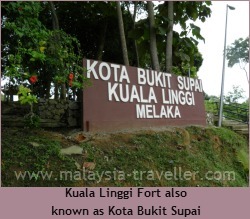 Following a short war in 1757 between the Dutch, who occupied Melaka at the time, and the Bugis, who were vying for influence in this area, both sides agreed to jointly build Kuala Linggi Fort as a gesture of reconciliation. It enabled the Dutch to monitor and control all ship movements on the Linggi River and this stretch of the Straits. In particular, the shipment of tin ore from mines in the Linggi River and Rembau River basins would have to travel past this point where it could be intercepted and taxed by the Dutch (which was a bit cheeky seeing as Rembau was in Negeri Sembilan and not subject to Dutch rule). 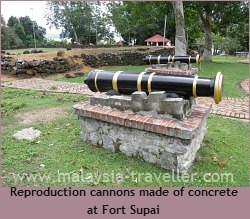 The fort was manned by a company of mercenaries, probably sepoys from India which is the likely source of the word 'Supai', supported by a few Dutch soldiers. This arrangement with the Bugis did not last long and the Dutch abandoned the fort soon after its completion. 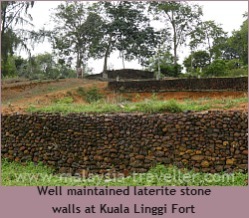 The remains of red laterite stone walls mark the perimeter of the fort, which was once surrounded by a moat. None of the original buildings inside the fort survived but thanks to the miracle of Google's satellite imagery we can get an idea of where the buildings stood from impressions left by their foundations. Some archaeological excavations were carried out here a few years back and as well as the broken cannon they found some coins and clay pots. A number of cannon reproductions (made from concrete) have been placed around the fort for effect but none of the original cannons remain on his site. This historical monument is being reasonably well maintained with grass kept short, paths weeded, picnic gazebos constructed and the walls kept clear of vegetation. Some unsightly abandoned concrete buildings (a development project gone wrong?) in front of the fort have been partly demolished and their rubble is slowly being reclaimed by the sea. One abandoned building still stands as at July 2012. There was no caretaker or security guard on duty when I visited. 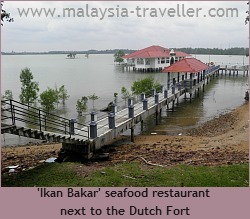 To help attract visitors to this historic site, the Alor Gajah authorities have built a seafood restaurant on stilts linked to the fort by a walkway. Call or SMS 012 - 3939324 to check when it is open. The location is marked on the interactive Google map above. It is about 50 km from Melaka City or roughly 40 km from Port Dickson. There are lots of pretty villages on the way so take your time. Tanjung Agas is located on the northern bank of the Linggi River where the road bridge crosses from Melaka to Negeri Sembilan. Here there are some restaurants and a jetty popular for fishing. Hutan Lipur Pasir Panjang. A small forest reserve where you can picnic among tall trees next to the sea. Pengkalan Kempas. Famous for an ancient tomb and megalithic stones.